I have a bad habit of over-planning, making grand plans that would be inconceivable to complete in whatever short time span I’m presented. Of course, this results in me spreading myself too thin on occasion when on the road. I mentioned in the first Part that my AAG Boston experience was somewhat truncated, so if I was going to pursue a couple of re-photography sites, I would need to act strategically. This meant that I needed to sacrifice at least one morning of the conference, which is never an easy decision to make. I also needed to take weather into consideration, since pouring rain and 50-degree weather (which would encapsulate the entire day and night Thursday) would not lend themselves to a hypothermia-free walkabout. Because it appeared that the rain would hold off for most of Wednesday and I had not committed to any sessions until that afternoon, I decided to start off my conference in side-project territory. After visiting registration early, buying an AAG hoodie on the way for a fantastic deal (I forgot, somehow, to pack something suitably insulated or warm for early April in Boston), I set out eastbound on Boylston Street toward the Common. Though I would normally take a detour through the park, the lagoons were drained and half of the paths were covered in mud. Some would still probably be interested in this “anti-tourist-gaze” dynamic, but because my time was somewhat limited and I needed to make it to Cambridge by lunch time, I kept walking. My first site, conveniently, sat right at the far corner of the Common at the corner of Boylston and Tremont Streets. My great-grandfather Ben Irving sent this Hotel Touraine postcard home from Boston on December 1, 1943. The information on the back of the card indicates this building was “erected on the site where John Quincy Adams, sixth President of the United States, lived, and his son Charles Francis Adams, Minister to Great Britain during the Civil War, was born. Opposite Boston Common.” It does not provide any dates, but according to the National Register of Historic Places, it went up in 1897 and operated as a hotel until 1966, when it closed down to become an apartment building. Its early-20th century charms included an impressive little hotel library. The farthest I got into the building was the security desk, as you’d expect with any private residence. I spoke for a few minutes with the desk clerk Mike, who took my card and told me he would pass it along to anybody in the leasing office with a historical interest in the building (nobody was there at the time). He also told me about one elderly resident named Elaine who he understood had been a resident of 62 Boylston (as it is currently known) since 1967, the building’s first full year zoned residential. As one should be able to make out from my picture, the street level entrance of the building on the SE corner of Boylston and Tremont is now a Starbucks. Here was where my day got interesting. This postcard, which has been damaged since I inherited it a few years ago, was mailed home from Boston on September 24, 1935. The caption on the back reads “NEW FEDERAL BUILDING AND POST-OFFICE. Boston Postal district is the fourth largest in the United States. Postal receipts of this district aggregate more than $13,000,000 a year.” According to the US Inflation Calculator, that amount inflates to $231,344,014 in today’s currency (cumulative inflation 1,679.6%), which is impressive either way, given how much more communication was done via the Post back then (and how much more efficient the system was). At the end of my PechaKucha talk about the Ben Irving postcard collection, I implored my audience to “always, always, always” ask (I think I used “always” three times for Marge Simpson-style/’part of us all’ repetition/emphasis). After snapping that surprisingly challenging photo of the building from the far corner of the intersection, I wandered into the main entrance, which is probably impossible to discern with the construction scaffolding wrapped around the first level of the building, but it’s there in the center. The security guards were hardly warm and cuddly, but the first couple of whom I spoke to near the metal checkpoints offered suggestions for who to seek out upstairs. Immediately after the checkpoint, a set of steps leads you up to the second floor, where I took that photo of the sign that they never bothered to junk when the news stand shut down (date unknown). Today, the EPA’s Boston offices sit in that space, and a couple EPA employees with connections throughout the (somewhat vacant) building were happy to show me around. One EPA employee (whose name I forgot to write down) brought me up to the third floor and introduced me to Jim Sheehan of the GSA. We chatted for a few minutes, and he told me that, contrary to what I had assumed, the McCormick building actually pre-dated the WPA era. I had only assumed it was a WPA building since a 1935 postcard was showing the building off, but he told me it was an easy mistake to make. I would later find the GSA’s broadsheet about the building, which had more information that I should have probably looked up before going there. The EPA employee brought me by the old post office window bay, which had long fallen out of use, but were virtually untouched for decades. He also brought me upstairs to a beautiful old courtroom that had also fallen out of use since the era of the Anderson vs. Cryovac, Inc. battle in 1986 (which would inspire the Jonathan Harr book A Civil Action, which inspired the 1998 John Travolta movie of the same name, which was filmed on site in said courtroom). Most of the legal texts had been removed from the shelves, but enough remained to lend the room a slightly creepy semi-used aura. The Depression-era brass/steel doors that led to the original judges’ chambers were also among the coolest I had ever seen; nobody really knew the last time half of them had been opened. In retrospect, it’s probably better that I forgot the EPA employee’s name since me saying any of this may get him into trouble. So, yeah, if you’re curious about a place, always ask. The next destination was a bit more confusing to find and a bit less security-heavy. 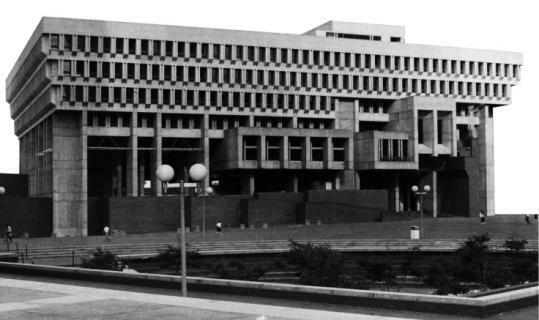 Because I care about my readers, I’m not going to subject you to any images of the brutalist atrocity that the city government moved into post-redevelopment. Nope. None at all. Let’s focus our gaze instead on this 19th century building, tucked away around the corner from the Old South Meeting house. The Meeting House, by the way, was the first building the the U.S. designated for historical preservation, and remains today a key reference point. I actually bumped into my colleague Jordan Brasher across the street from it, as he was headed to meet an old friend for coffee nearby. I wasn’t expecting to run into any geographers that far away from Hynes that early in the conference week, but I clearly wasn’t the only one taking advantage of the window to wander. Anyway, the postcard there on the left is one of the later items in the Ben Irving collection; he sent it home from Boston on January 21, 1952. The front caption is visible above, and the rear caption reads “Boston City Hall located on School Street dates back to 1865. A Latin School stood here in colonial times, later the County Court House. Statues of Benjamin Franklin and Josiah Quincy stand at the entrance. At the rear is the City Hall Annex.” The statues are still prominent, but I’m not entirely sure what part of the building constituted the Annex. As I was taking the photograph(s) recreating the postcard shot from the corner of Province Street, the scrums of tourists wandering around the sidewalk in front of the Hall diverted a bike messenger, who crashed into a pillar and flipped over his handlebars onto School Street. I was looking away when I happened, but I heard it as it happened, and walked over to check on him as he slowly got up and got back on his bike. As one should be able to make out from my picture, the street level entrance of the building next door is now a Starbucks. The restaurant with the red awning that used to occupy that space was called Purcell’s (difficult to make out on the postcard, perhaps intentional, though Thompson’s Spa is prominently labeled in the background). Sean McCullough, who worked in the Old City Hall’s management office downstairs, told me that the Starbucks kept the original Purcell’s tiles at its corner entrance, but I couldn’t find them. Also, there was not much room to wander into the coffee shop and inspect the floor without having to order something out of guilt. Seriously, I could probably compile an entire photo collection dedicated to Starbucks that currently occupy spaces in historic city scenery, but I’m not doing that without serious kickbacks from the Starbucks Corporation. They already have enough free advertising from the customers on Instagram (and I suppose writers who complain about them). Ben sent this one home down to Brooklyn late in the afternoon of November 15, 1943 (two weeks before the one of the Hotel Touraine). Due to the historic status of Harvard’s buildings and the clearly demarcated and still existent (unlike some squares in Boston) landmark, the site was very easy to identify. I tried to recreate this angle; I really did. But timing and fate prevented it from happening. The best I could do was that shot from the opposite side of the T station entrance from the Harvard gates. I deduced almost immediately that the postcard image was taken from atop the Abbot building, a flatiron-type structure located at 5 JFK Street. Given my longstanding inability to let sleeping dogs lie, I wandered into the Curious George shop to ask the employee if she knew who had access to the roof. Of course they didn’t. I found the entrance on the side nearby and wandered up the stairs (the lift was broken, which was fine since it did not look like anybody used it anyway). The window with the “Dewey, Cheatham, and Howe” (get it?) decal on the third floor would have been a great spot to recreate the superior angle on the Square, but of course Car Talk staff office had nobody home when I knocked on the door. I wandered up to the fourth floor, where I found a very intimate Dentist’s office (the office was intimate, not the dentist… I never met them so the jury is out on the latter). I spoke with the two receptionists, including one girl with a thick Boston accent who told me I could, in spite of hand-written signs that said otherwise, could go out on the lower level of the roof. Every moment I spent outside, though, I felt like someone on a different floor or in a neighboring building would see me and call the cops. The level they had access to was a flight below the main roof and on the opposite side of the building from Harvard Square. I walked over to the ledge, leaned around, and snapped this photo (right) around the side aiming toward Lehman Hall. It wasn’t great, but it was the best I could do in the circumstances. The entrance to the top roof was padlocked. As I mentioned in Part I, my parents came up to meet me, my cousin, and her husband on Saturday. I told my father, who worked for FEMA through the early 1980s, about my visit to the McCormick building. He told me he used to work there. I didn’t believe him, since the GSA and EPA guys told me that FEMA had been located at 99 High Street since the 1980s. ‘No,’ he said, ‘FEMA’s offices were in the McCormick Building when I worked there. They moved to 99 High Street after I left.’ What made this seem crazy was that I have clear memories of going downtown with my mom to visit my dad in his office when I was 2 or 3 years old. This means that I had been in the building before, about thirty years earlier. The only part I can still remember was the cluttered FEMA office (FEMA? Disorganized? Unbelievable, I know), but apparently the building had not changed a whole lot since then. Discovering this all, post-facto, from a short conversation with my father blew my mind. Hope you have enjoyed reading this! Tune in on Friday for the third part of this AAG/April recap with a bonus re-Photography excursion in the Sunshine State. It’s that time again… AAG 2017! Italian food in the North End, strolling through the Common, record shopping in Cambridge, comedy in Allston, and more crammed around the whirlwind of academia, mapping, and GIS happening over five fun-filled days at the Hynes Convention Center. For anyone who wants to come see me give my paper, I’ll be presenting in Session 3566: QUALITATIVE METHODS IN HUMAN GEOGRAPHY, SESSION A on Friday 4/7 at 3:20pm in Columbus 1, Marriott, First Floor. I’ll be presenting along with Beyhan Farhadi (University of Toronto), Rae Rosenberg, Heather Maguire (Brock University), and Jeff Rose (University of Utah), none of whom I’ve met before. I was also invited by my colleagues Joseph Palis, Severin Guillard, and Ola Johanssen to be discussant for a paper session about Spatializing Music Performance. Regretfully, the AAG algorithms-at-large scheduled these two sessions concurrently, so I won’t be able to attend or make my debut as a discussant, both of which I had been seriously looking forward to. This will actually be my second conference in Boston; I went up in early 2015 to attend the Harvard ‘Hearing Landscape Critically’ conference and do some research about Frank Hatch, which I’ve chronicled on here before. I learned a lot about what sound semioticians (for lack of a better term, though I’m sure there are dozens) from all over the world have been doing then. This time, I’ll be grateful to be back in the city of my birth alongside at least nine thousand fellow geographers and well-wishers. Downtown crossing at sunset. Photo by Tyler. Per usual, I’m looking forward to a bunch of great panels, speakers, and delivering my dissertation chapter about oral histories in underground music. It’s going to be a great time. Outside the conference, I’m going to attempt to follow up on some of the Hatch research, do some postcard re-photography, and I may even find another excuse to tweet at Damon Krukowski. (While I’m on the subject, I guess he’s got a new book coming out that looks really cool. If being in Galaxie 500 and rooming with Conan O’Brien at Harvard doesn’t give you all the cred in the world, I don’t know what would). Can’t wait to see you again, Boston. You’re ridiculously expensive, cold, unfriendly, and absolutely the greatest. Don’t ever change, especially before I get there tomorrow night. By the way, if you can’t make it by the conference and want to say hello, get in touch with me. I’m around until Saturday and don’t plan on sleeping that much. A note on “You Can Easily Find Your Way in Boston”: My great-grandfather sent this postcard to my great-grandmother and family in Brooklyn late on September 26, 1935: “Dearest – Will be here all week and maybe next week also. Will send you money Sat. Love you dearly & how. Hope you’re O.K. & my daughter the dear. Regards to all. Irv.” For anyone interested in his story, I’ll post my Pecha Kucha talk soon. via the Onion A/V Club. The Lord helps those that help themselves, man. I recently discovered that the 2017 AAG Meeting in Boston will be hosting the first annual geographic film session, called AAG Shorts. That is so cool. I’m glad to see that filmmakers have the opportunity to screen that work in an academic setting, particularly as someone who uses film, music, and even film-music to illustrate the importance of cultural geography in my classes. One of my few major regrets in life was letting film making slip out of my set of hobbies at the end of the 2000’s. At the time (before I was actively pursuing Geography as a career), some friends and I produced a handful of short films and sketches, which I’ll be going through to see if I have anything that may be relevant or appropriate for submission here. Or, if you have the time and resources to whip something together now, you have 6 weeks. Regardless, I’ll copy and paste the call for films below the line in case anybody in the Boston area or anyone planning on attending AAG are looking for a new alternative outlet for your project. Good luck! New for 2017 in Boston! Are you a geographer who has produced a short film – or are you thinking of using film in your research? If so then submit your film to AAG shorts launching at next years AAG meeting in Boston. Successful applicants will be invited onto a panel for a special Q&A session. A selection of the films will also be uploaded to the AAG website. Films can be made specifically for AAG Shorts – or already have been produced for other reasons. Because this is the first year any year of production and length will be accepted. However the preferred length is 20 minutes or less. Preview Format DVD or online secure screener (.eg. Vimeo). You can also submit your film (H.264, mp4, avi etc) via file transfer (e.g. myairbridge) Trailers will not be accepted. Applicants need to say whether they will be registering to attend the meeting. A copy of each selected film will be kept by the AAG Shorts Panel as part of the archive and for internal purposes.